To reset WiFi and password settings, press and hold the RESET button (located under the white front panel next to the power terminals) for 5+ seconds. When you release the RESET button you must hear a loud beep sound. The RainMachine Mini-8 system will automatically reboot. The reboot process can take up to 2 minutes. Note: Resetting the RainMachine Mini 8 device will erase only Wi-Fi settings and the password. Other data, like location, program schedule & properties, zones properties, restrictions will not be affected. 2. 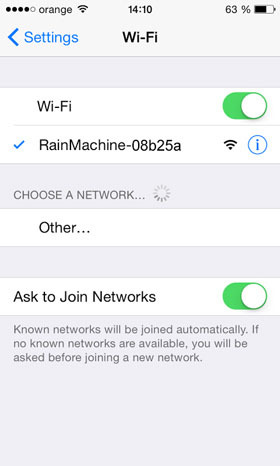 Join the "RainMachine" Wi-Fi Network From Your Smartphone. After the reboot process is complete, the RainMachine Mini-8 display will show the letter "A"
3. Launch the RainMachine Smartphone App to Continue. Launch iOS / Android RainMachine mobile app on your smartphone. Go to Settings -> System Settings -> Network Settings. 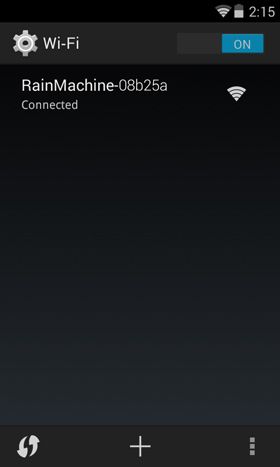 Setup your home Wi-Fi network (choose your home Wi-Fi SSID name and then enter it's password (if any). You will then be prompted to add a new password to your RainMachine Mini-8 device.